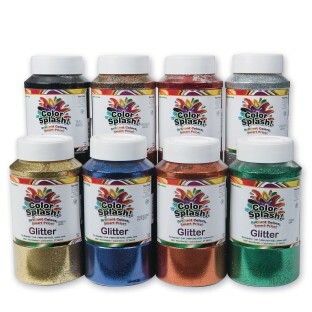 For a longer-lasting sparkle, try Color Splash!® non-tarnishing glitter to brighten craft projects, create beautiful masks, personalize greeting cards, liven up posters, and decorate packages. Sprinkle over glue to give ornaments, paper or fabric creations a touch of brilliance. Convenient 1-lb. plastic shaker-top containers reduce spillage and snap tight for easy storage. Nine popular colors to choose from: blue, gold, green, multi, red, silver, copper, iridescent, and black. Non-toxic. Always fun to work with glitter. Excellent value- 1 bottle will certainly last you 100 lifetimes! The teachers and student loved it. The are always wanting glitter and we have to purchase them in small amounts as the need them. This allows us to keep it on hand and fill the small bottles as needed. Great Quality and a good value. Just what we needed and a good value. Bought several containers for THIS year's VBS. Was very pleased with the size of the container the glitter itself. Will make some BEATIFUL snowflakes.